For the past several months I’ve been participating in a master class of sorts for the B’Sue Boutiques Build a Line Challenge and it’s been a non-stop learning experience! This saying has been my guiding light for much of the time as I found myself wondering how to reach my vision on more than one occasion. 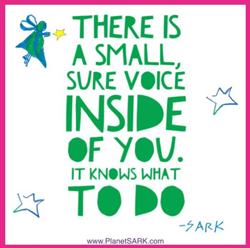 When I get stuck, I find that I need to get quiet and meditate and the ideas come flooding to me! As I’m accompanied on this journey by 55 other wonderful, creative jewelry designers, makers and hobbyists, I see a myriad of experiences that we share in the group. Some of us know exactly what we want to do and are executing our vision flawlessly, some of us have become stuck only to reach out for the support of the other participants that are so generous and supportive, and some of us are only starting to find our way. While I can’t speak for everyone in the group, I have a strong feeling that we are all learning and growing, not only in our jewelry design endeavors, but in our lives as a result of being courageous and stepping up to accept the challenge. And speaking of others on the journey, we discovered that there are four of us in Colorado, and we've been able to get together in person to see our designs and to support each other. You can see the Colorado Connection on the left with Lori Prull Meyer (top left), Alexandra Sefton (top right), myself (bottom left) and Maria Clark (bottom right). They are so creative, talented, supportive and fun, I know we're forging a friendship that will last into the future. And, even though the other participants are scattered around the world, I've become Facebook friends with many. And, not surprisingly, everyone that I've connected with is positive and creative and I enjoy reading what's happening in their lives through Facebook posts. 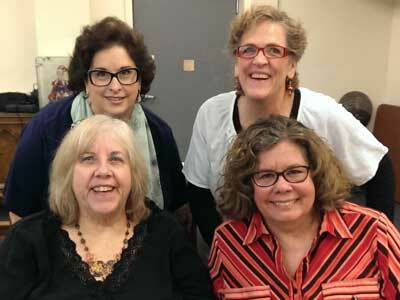 I feel a great sense of community and am so grateful to Brenda for putting this awesome group of women together! The goal if this challenge is to have a cohesive line of jewelry at the end of three month period when we have our final blog hop on March 20. In order to reach that goal, I’ve had to think about how and why I create jewelry, how I’ve done it in the past and what I want to do in the future. 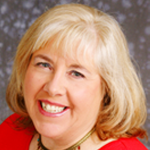 Our wonderful leader and mentor, Brenda Sue Lansdowne of B’Sue Boutiques, is guiding us on this journey. In the past, I’ve mostly done one-of-a-kind designs, so the real challenge for me has been to create designs that can be done quickly and efficiently as part of a line and that fall into the bottom two tiers of the pyramid. Since my theme is “When Brass meets Glass” (or "Kiss my Brass" as my friend Mel renamed it) and features the wonderful lampwork beads from Grace Lampwork Beads, I’ve been able to have my cake and eat it too. By using different lampwork beads as the center-piece, I am creating a cohesive line that includes a basic design, but with different beads and different colors.The photos below shows a design in various stages; raw brass pieces, a Grace bead, the piece being clamped after painting, sealing and assembly, and the finished focal piece which can be used as a necklace or brooch. 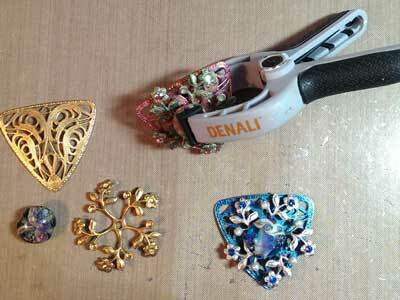 I choose to make these three pieces into necklaces, but brooches will be added at a later time. The pendant focals have the same basic design, but look very different because of the lampwork beads used along with the colors I painted the raw brass and the different neck treatments. These necklaces will be priced around $40. So far I’ve done necklaces, earrings and a bracelet. The three necklaces in the line so far have matching earrings and the purple set has a matching bracelet. 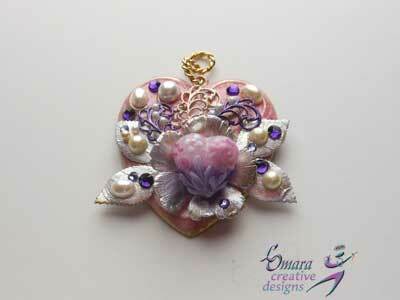 I plan to use a similar design for more necklaces, bracelets and brooches. You can tell from the designs I’ve shown so far that I love to paint metal with bright colors. Since part of the challenge is to create a sellable line, I made a simpler necklace with more earthy tones. I was having trouble finding just the right color for the flower piece behind the lampwork focal, so I torch patinaed the flower and got wonderful colors that work great with the bead! I’ve also started several other pieces that don’t have the neckline treatments on them yet that are using puffy hearts as the centerpiece. My challenge with the hearts is finding a backing component to nest the hearts in as they are not flat on the back. This is a challenge with the beads too, but not as much as the hearts. I think the pieces to the above will work as part of a cohesive line, and I would appreciate your thoughts, dear readers, as to whether they do or not, so please leave a comment about them if you are so inclined. 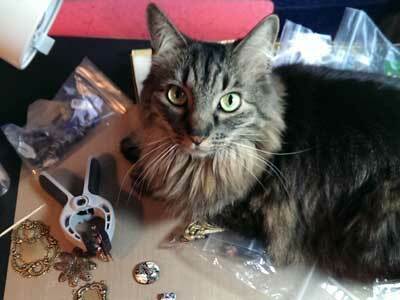 As usual, my lovely creative assistant, Ms. Tessa Kitty, has made herself known. She’s managed to plop herself in the middle of my work table or on my lap where she lets me know in no uncertain terms that she doesn’t want me to get up. So, I’ve resorted to doing my stringing while sitting in my chair with my trusty companion on the footrest beside my legs, with an occasional trip to lay on my chest when she feels that she’s not getting enough attention. So, that’s about it for me at this point. Stay tuned for the next and final blog hop on March 20 where we'll be revealing our complete new jewelry line, and please be sure to visit the blogs of the other participants in this challenge that are shown below. And, be sure to visit the B’Sue Boutiques website, and YouTube channel. 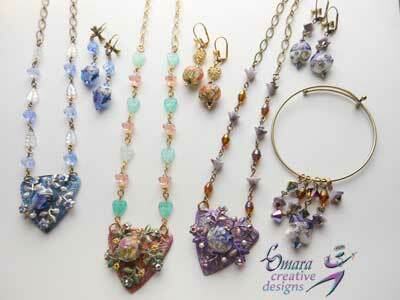 I don't have an online sales site yet, but you can see more of my jewelry at https://www.facebook.com/LOmaraCreative. Below is a list of the other jewelry artists and designers that are on this three month journey with Tessa and me. Whether you're in the challenge or are someone who just found my blog, please visit the blogs below and feel free to leave comments if you like their story or their designs (or their assistants) for encouragement. We're all in this together and at the end, we will all be better designers and able to offer wonderful lines of jewelry to the world. Wow! Your pieces are very pretty. The group photo where you show your necklaces, bangle bracelet and earrings really highlights the cohesiveness of your line I think. Well don! Lynda, what an enjoyable read and your line is so pretty. I'm looking forward to seeing the rest. The colors are beautiful! Well done! I'm jealous of you girls and your play date! Love your color palette! Those lamp hearts are sweet too! I have two hearts and I hoard mine lol Great job! Good post good points! I really like your pieces so far and the lampwork beads are wonderful! There IS a commercial piece you can buy (I've seen it but can't remember where) that is a brooch adapter. You can convert any brooch into a necklace OR if you do simple wire work, there is an easy converter you can make. That would be incentive for anyone to buy a brooch and add it to their own chain. If you made your own, for maybe pennies, you could sell it as an add-on, or a buy a brooch, get a converter for half price selling pitch. Nice work girl. these are beautiful and I think they work very well together! Your blog is great and your jewelry is absolutely beautiful! Great work from a great artist! Lynda, the mini assemblage on your pieces is so lovely. The glass beads add color and interest - how wonderful. beautiful work and I love it! great blog! Love your line! Every piece is beautiful and works well within your theme. 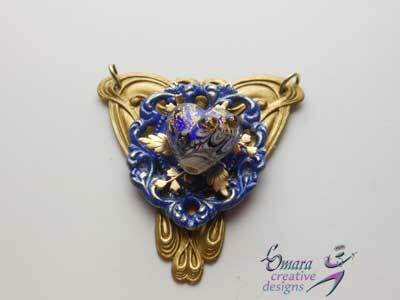 The lampwork beads add a lovely touch. Looking forward to more of your pretties! Your line is coming along so well. The coloring is lovely and each piece looks very wearable. I can see your customers wanting to collect not just a matching colored set, but sets in every color. You've got it! Well done, excellent blog post. As you reach out to do more selling I hope you find the principles in the class continually helpful so that whichever way you take this...it takes you exactly where you want it to. Beautiful work, my friend! Your colors are gorgeous and I can't wait to see your completed sets! 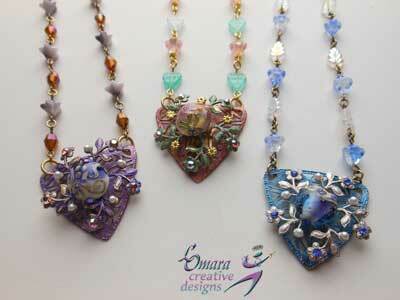 I love your line and your gorgeous color pallet, i too love color and glass beads. Wonderful post, and it's awesome how your girls got together to create together. XOXO! Great pictures! You're lucky to have friends close by that you can meet with! Absolutely looks like a related line. Great job! Really like the design and colors. 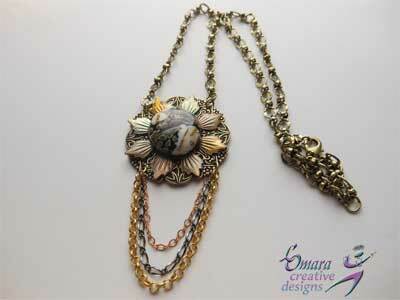 Love the stampings you used and the chain is beautiful. Really sets the focal off. Lynda, your line has wonderful color and cohesiveness. Great job. Looking forward to seeing your complete line next month. Those beads are so lovely and you've matched your metals to them so well. Great job of mixing and blending the colors. It looks like you all had a great time together! Beautiful and Colorful! Can't wait for your finished line! Well done!! Beautifully executed design, Lynda! I am just bloghopping on this wonderful challenge...such beautiful creations! great colourful line- looking forward to seeing the whole collection in a month! Great Post! Your colors are awesome and I of course love the earthy one the best!!! LOL Great Job!!! Be Blessed! Looking good, can't wait to see it all together next month! Great job in keeping with your theme, Lynda! Love how you're using the B'Sue bases with your pieces. I too hoard, I mean have a collection of Grace beads. What a lovely way to present them. Those sets are gorgeous. Love your necklaces painted to match the lampwork. beautiful posting. Very nice! I look forward to the completed line reveal! Linda Thank you for sharing your designs Im so excited to see your whole line tomorrow.